Most of us are familiar with the tale of Lucifer. Once considered the most beautiful of the seraphim, first amongst the highest level of the celestial hierarchy, the Morning Star one day decided that he, and not God, should rule the firmament. A war ensued, with the angels loyal to God on one side and Lucifer and his adherents on the other. According to the story, Lucifer lost, and for his hubris, he and his minions were cast out of Heaven and into the netherworld, giving Milton a great quote opportunity and writers everywhere a ready-made bad guy. But what if Lucifer was not the only seraph to ever rebel? What if some of the heavenly host became angry that God placed Man above them in His esteem? Unhappy that humans, who have free will and can therefore choose not to love God or even acknowledge his existence, were more beloved of God than the angels, who had no other choice but to love and serve God? And what if these seraphim started a second war? A war that waged for eons, attempting to displace humankind in God's affections and once again be His most treasured. A war that kept the souls of the talking monkeys, as these renegades derisively refer to humans, from leaving Purgatory and going on to their just rewards, whether that be meeting St Peter or meeting the Prince of Darkness. A war that, at times, does not confine itself to the celestial plane, but involves both sides using humans to further their own cause. Such is the premise of The Prophecy, which follows a former novitiate-turned-cop named Thomas Daggett who gets caught up in the latest round of this heavenly battle. And this is really one of those films that to give away anything about the plot will spoil some of the fun, but I can tell you it involves the loss of faith, seraphim on both sides of the battle visiting Earth, a teacher on a reservation, Native American mysticism, a little Native American girl, the discovery of one's true calling and an appearance by Lucifer. Oh, yeah; one more thing. It stars Christopher Walken as the Archangel Gabriel. Now, Christopher Walken is pretty much worth the price of admission any time, but it helps to know if the remainder of the film surrounding him is worth the bother. And fortunately for all concerned, this movie is a ripping yarn on its own terms; Walken is just the hot fudge sauce poured over the Breyer's French Vanilla ice cream. 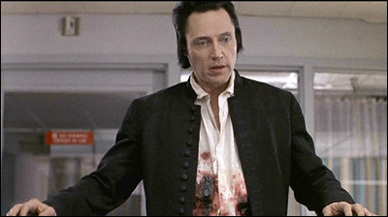 Christopher Walken has perfected that particular type of crazy where you know there's something that's off about him but you're not sure exactly what, but he's so charming and everyone seems to like him so much you give only the barest voice to your misgivings. Until he snaps the neighbor's neck for getting water on his car with their sprinkler, and then you go round yelling to all within earshot that you told them all something was wrong with him but they wouldn't listen. And he puts that perfected character to good use as Gabriel. One wouldn't expect an archangel to be menacing and sinister, but Walken conveys exactly that, as well as a sort of wounded pride over the loss of status for the heavenly host, and a genial charm that is often at odds with his actions. The rest of the cast, including Elias Koteas as Daggett, Virginia Madsen as the reservation teacher and Viggo Mortensen as Lucifer, as well as Eric Stoltz, Amanda Plummer and Adam Goldberg portraying the other main players in the film, is uniformly excellent, and they are working with a script that is a couple of cuts above your average horror film. Plus the special F/X in this are fantastic; I have to give extra praise to the F/X employed when an angel is killed and the final scene with the Native American shaman. The Prophecy's 98 minutes fly by at a brisk pace, and the entire film is a well-acted, well-scripted and thoughtful piece of cinema that doesn't sacrifice the horror to set up its plot, nor the reverse. Of the two sequels - cleverly titled The Prophecy 2 and The Prophecy 3 - I've only seen 2, but that one definitely lives up to the standard set by its progenitor, expanding on the universe and mythology whilst still telling a great story and using topnotch F/X. I highly recommend both of the first two films, and will go so far to say that the third in the (so far) trilogy is worth a look, if only to advance the great story laid out in the first two. Besides, Christopher Walken. 'Nough said.